Saffron or Kesar is widely known for its skin lightening properties and the way it boosts the skin’s radiance. Saffron makes skin softer, even toned and brighter. 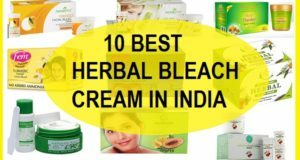 It’s these properties which makes it a very popularly used products or ingredient in herbal products formulated for fair, glowing skin. Even in Ayurveda role of saffron is well defined, as to how it makes skin fairer naturally. 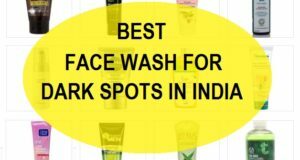 It shows its results when taken internally or when applied as face packs, face scrubs or as skin care products infused with saffron extracts. 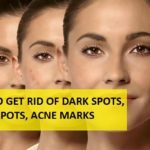 Saffron face packs are excellent and incredible to get fair skin, but there can be one concern, which is its price, since it has to be taken in very minimal quantity to obtain its benefits that won’t cost you much. A little bit will last really long and shows great results for your skin. 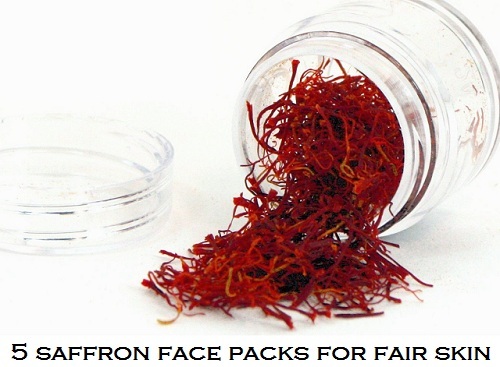 Here are recipes of 5 Saffron fairness face packs that can be prepared at home. When you have dry skin and need that extra glow, radiance and fairness, try this quick remedy to get instant brightening. Take a teaspoonful of milk cream (malai) and mix few strands of saffron into it. Let the strands soak well for a couple of hours and then mix it thoroughly. Apply this milk cream infused with saffron extracts on the clean face. Keep it for 15- 20 minutes. 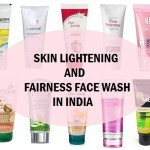 Wash you face with plain water to notice a healthy glow with fairer skin tone. Milk has lactic acid which helps lightening complexion whereas saffron just boosts the results, multiplying the skin lightening properties of this face pack. It’s a great fairness face pack for dry skin as milk cream nourishes and naturally treats the dry skin, cures dry patches and flakiness. 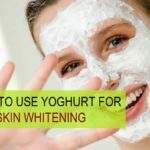 Milk cream at times can block the pores, if not handled well, therefore, if you have oily to combination skin then milk cream should be replaced by regular plain milk. This saffron face pack is an excellent age old remedy to get fair skin. 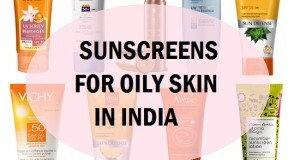 Since ages, we have been told to apply saffron (Kesar) and sandalwood (chandan) to get fairer even toned skin. 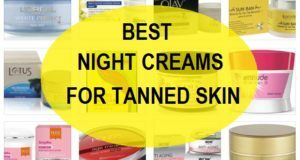 We can’t drastically change the skin color and should learn to love our original skin color but that is also true that the complexion can be brightened and enhanced with regular usage of natural treatments like these. So, coming back to this amazing face pack, you will need sandalwood powder or paste whichever way you prefer, some milk and a couple of strands of saffron. Now, mix all the three. Make a paste using the milk or rose water. Rose water is recommended for oily skin mostly. 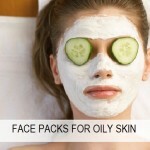 Apply this face pack for 20 minutes and then rinse off. Skin feels fresh and rejuvenated. Sandalwood is quite aromatic. This sandalwood and saffron face pack is bound to give you fairer skin within days and glow as an added bonus. Men can also use this to enhance their complexion. Acne can make you conscious and irritated with constant breakouts and the marks left by. This saffron face pack is ideal for the youngsters or adults who are facing acne. Mix saffron strands, neem powder or leaves, tulsi powders or leaves in a small bowl along with some rose water. Grind them, if you have used the leaves or just make a paste if you’ve used the powders of neem and tulsi. Once you get a paste, apply on the face rinse off after 20 minutes. Doing this quick treatment twice in a week, results in lesser pimples. Pimples get healed faster and marks will lighten eventually. 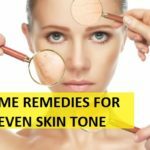 Dull, tired and patchy skin isn’t attractive. To revive and make your skin glowing, this easy face pack using saffron and papaya will give you even toned, lighter and glowing skin. Take a small piece of papaya and add few strands of saffron into it. Make a paste. You will not really need anything else like water or milk to make a paste as juice of papaya will help make the paste. Apply this paste on the face and wash off the face after 20 minutes. This rejuvenates the skin instantly, exfoliates mildly due to which skin appears brighter, smoother and radiant, saffron and boosts blood circulation and lightens the skin with a radiant glow. This is a good saffron face pack to be tried for soon to be brides or when you have an important event, ceremony or wedding coming up to attend. This treatment can be done 2 times a week. 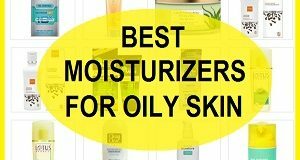 It is ideal for all skin types and men. 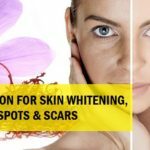 This saffron face pack with banana and honey is very good to get back the lost glow especially when the weather is getting dry and cold, with the approaching winters. Take a teaspoonful of honey with few strands of kesar and a teaspoonful of mashed banana. 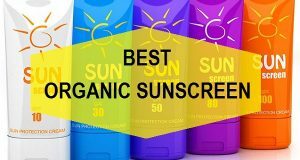 Mix them well and apply on the face, wash your face after 15- 20 minutes and see the results. This saffron facial pack brings back the glow and heals the skin, saffron at the same times improves skin complexion and makes skin fair. This face pack can be tried 2-3 times a week in winters for all skin types. These were some saffron face packs for fair skin and to get the radiance and glow. Once you start using them religiously and regularly, they are bound to show their results. Saffron is slightly expensive but since you’ll need just a couple of strands, that won’t feel, you are spending too much and most importantly, it will be all natural. Hi mam.. This is sweta.. I have pigmentation over my mouth around..n on my hands palm so can u suggest me anythng regards my prblm? My daughter who is 4 yrs old, has this scar on her cheek . I have been applying aloe Vera gel, not much improvement. Any recommendations please.. it’s an old scar ..